At the request of an adoring fan, we paid the $10 to keep you all in the loop. 🙂 No radio silence over here! 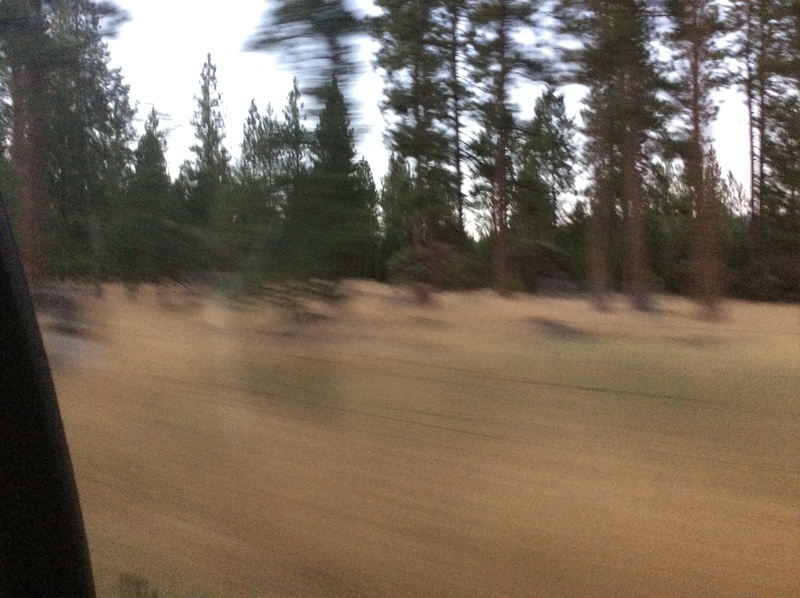 We took a route toward Bakersfield, and then north from there toward Yosemite. 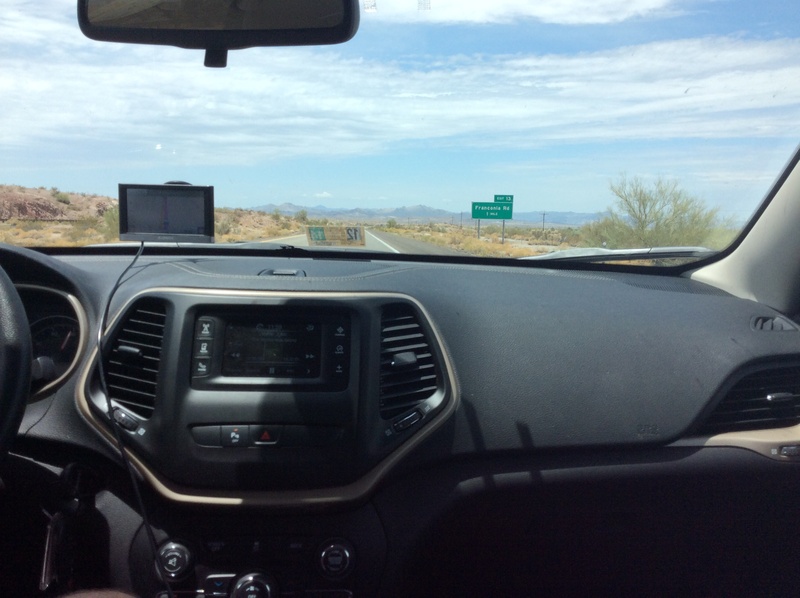 The scenery changed from the sandy plains with scrub and cacti in Nevada (we even saw a coyote!) to more wooded areas and mountains in California. The drought in California was apparent–dry grass is everywhere. We wonder how Yosemite will look after seeing all the scorched grass and fried foliage along the roadside. 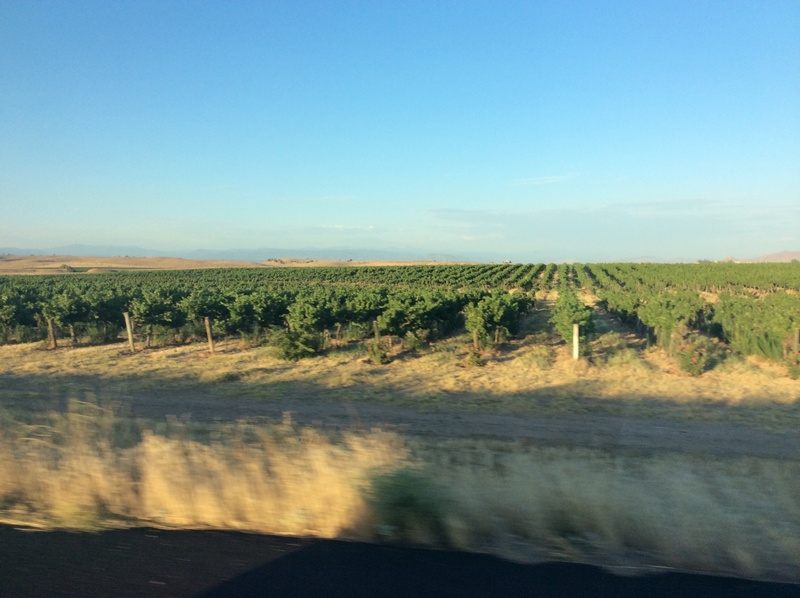 A glimpse of some California grapes! 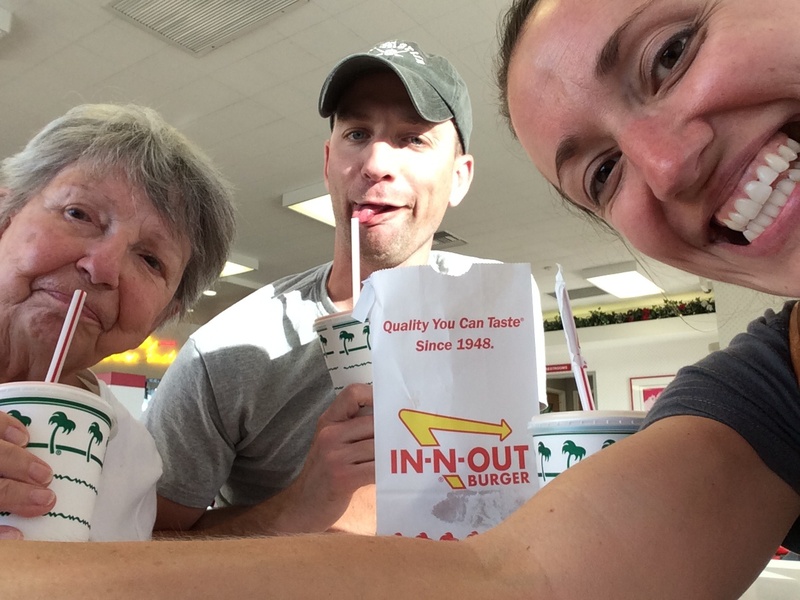 Once we were a little further into California, we made a pit stop at a true California institution–In-N-Out Burger. In honor of Jaclyn (with her recommendations), Tim got a burger and all three of us got neapolitan shakes. Our final ascent to the Yosemite View Lodge was quite a haul. Grandmother decided it was one of the curviest roads she has ever ridden. 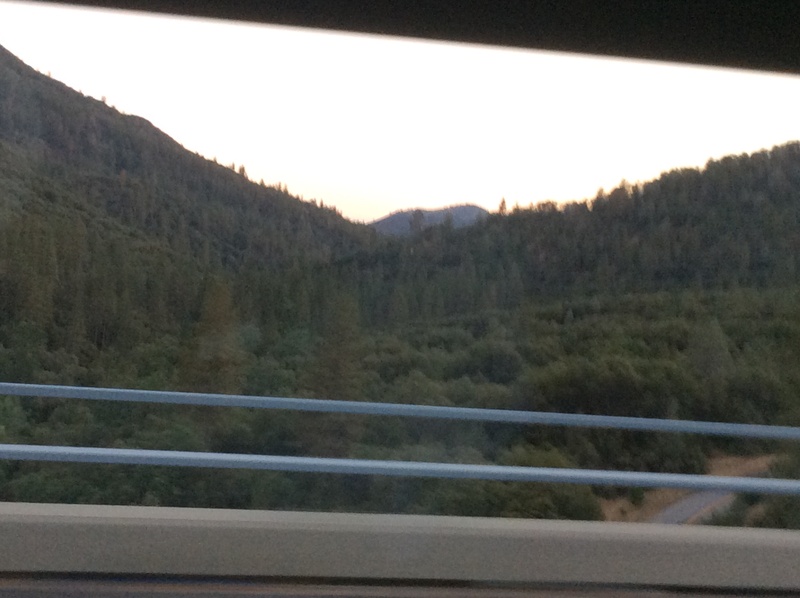 We drove for miles and miles and miles up and down the sides of a mountain, following the Merced River. We saw plenty of deer in the fading light of day, which encouraged Tim to go more slowly (an approach that was much appreciated by my churning stomach!). I rolled the window down and tried to make the best of it. Once we got to the hotel, we discovered an added bonus upon arriving to our room: though we had booked a room with two queen beds, we ended up with a room with two queen beds and an attached room with a king bed. Grandmother doesn’t have to share a room with the kids tonight! 🙂 The other bonus is that we have a small kitchenette, something we haven’t had anywhere else. It’s going to make lunch prep so much easier for me for the next two days. A highlight from the road today: Speech-to-text hilarity: Grandmother has started utilizing the speech-to-text option on her phone, which many of you may have experienced (if you got a message from her that made no sense, it was probably speech-to-text related). After sending a text message with this method, she didn’t realize it was still capturing her speech and converting it to text. She was commenting about how the texts often don’t come out the same as what she had intended. She said, “It doesn’t understand my hillbilly.” When she looked down at her phone, as if to confirm the fact, the text on the screen said, “It doesn’t understand my baby.” We got a good laugh about that! Car Story: My favorite non-interview related story today was the one Grandmother told about little Bonnie Belle who lived in the trailer next to theirs when Uncle Mike was little. She said that Bonnie Belle was quite a biter, and poor Uncle Mike would often come home saying, “Mother, Bonnie Belle bit me!” Grandmother got tired of poor little Michael being bitten, so one day she told him to just bite Bonnie Belle back. She said that Mike was too sweet and barely bit this girl. Bonnie Belle didn’t learn her lesson and continued biting poor Mike. When Mike came home again with teeth marks on his little arm, Grandmother told him he wasn’t biting her hard enough. She sent him back out to give her a good bite! She did add that she had talked to Bonnie Belle’s mother to let her know that Mike would be biting her daughter. haha! Tim says he will fix us a nice breakfast tomorrow before we head to Yosemite. I think this has been the park that he has most looked forward to seeing. After reading in our travel book about it, I have started to look forward to it even more. We’re going to try to stay most of the day in the park, and end the day with dinner at one of Yosemite’s restaurants. Adoring fan… maybe. I think she’s just nosy. I hope the shakes were as awesome as I remember!!! !